The thought of two people acting all of Pride and Prejudice seems farcical at the outset, more so when I realized that it was to be a man and a woman. I mean, just look at Elizabeth Bennet’s family! She’s one of five daughters, and in her whole household there is only one man AND SIX WOMEN! And, frankly, Mr Darcy isn’t around nearly enough to justify an entire man in the cast – at least two thirds of the characters are female! But there I was, at Jermyn Street, waiting to see what had been created and, honestly, hoping for the best. Fortunately, while Joannah Tincey and Nick Underwood do stick to playing the two leads, Elizabeth and Darcy (and in the appropriate gender), the choice of genders for the various other parts is surprisingly more varied than I expected. Mr and Mrs Bennet are as expected – Underwood with a pipe and Tincey rather frequently twirling a hanky (and talking in a very comic accent) – but there is quite a bit of variety into the casting otherwise, rather sensibly as the various characters tend to appear in pairs, Darcy himself being frequently seen with Mr Bingley, and the youngest Bennet sisters being somewhat attached at the hip. There is no doubt that Mr Underwood is extraordinarily flexible with his portrayal of the female roles. And, to my surprise, so is Ms Tincey as a man (whipping aside her skirt to show trousers). You cannot help but be somewhat astounded at what a rich job they have done at making these many characters come to life, with only the tiny bit of waffling (the middle sister who only ever gets to be a music stand; an occasional chair that is supposed to be occupied). So we’ve established that there’s much of a to-do with the actors popping on hats, picking up pipes, or carefully arranging a sash to give a military air. Despite this, the production as a whole has a feeling of carefully controlled simplicity, with only picture rails, a half-window, some boxes and a fireplace serving to recreate one after another interior scene (of people in widely varying circumstances) and, indeed, even the outdoors (as Elizabeth takes her many walks). 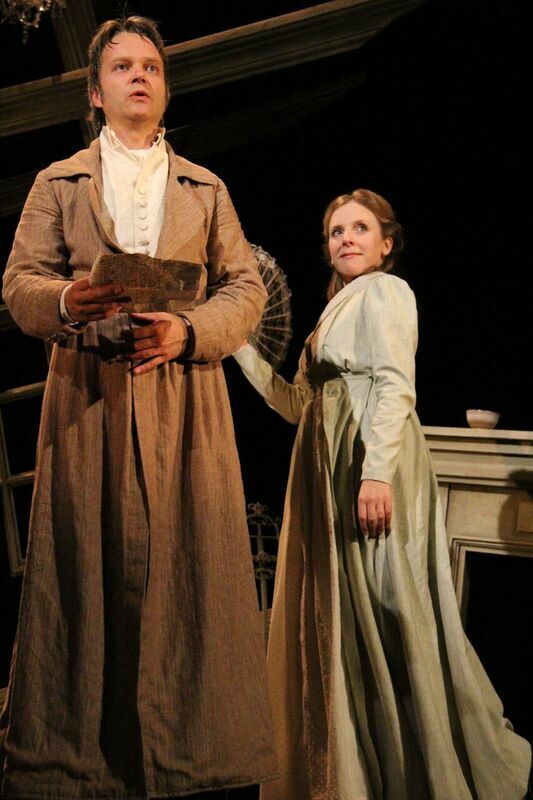 All of the richness is provided by the glorious words of Jane Austen and the highly memorable characters she created, who quickly became who I saw on stage as the scene required – the brash and stupid Lydia, grasping and shallow Mrs Bennet, formal and gentle Jane. What an accomplishment! And what a very good evening at the theater – it was a longish show but time positively raced by. Like the works of Jane Austen, this feels like a play one could see again and again – a classic performed with bravura and so, so much comedy. It’s delicious counter-programming for the festive season as well. Well done, all! Tuesday marked a special night for me: not just a trip to a new theater, but a trip to see an Ibsen play I’d never seen before! St John’s Night was receiving its UK premiere at the Jermyn Street Theater more than 150 years after it was written – actually rather a run of local enthusiasm for Ibsen since his play Emperor and Galilean (1873) had just made ITS debut last year. I was very excited to see a new play by my favorite 19th Century playwright – at this rate I might actually get around to all 26 before the end of 2020 (my total is now 9). I was also excited to go to a new theater space. Jermyn Street is a tiny little theater just steps away from the chaos of Picadilly Circus. Technically it’s in the West End, but as I went down the stairs off of an alleyway, it seemed like I might have been heading to an evening of rather seedier entertainment than usual. Still, there in a cubbyhole was a tiny theater seating about 80 folks, most of whom needed to be very very short if their legs were going to fit comfortably between their chair and the row in front of them. People: there is NOT ENOUGH SPACE IN THESE DAMNED SEATS. I sat sideways the whole time. Be warned that of the five or so rows in this theater, the first is (obviously) fine and the row that is on the walkway around the theater is also a reasonable seating option. However, in the second row, I found I had to sit sideways the whole time. Be advised if you come to this theater that you should take advantage of the fact it is general seating and FIND THE GOOD ONES. No real worry if you’re five foot tall or less, of course, but most of us aren’t. Venue shortcomings aside, let us return to the play. Inside the theater, I was met by two goblinesque men playing musical instruments strangely (tunelessly and, in the case of the violin, upside down). To their right were two houses, one a fairy-tale pink with white lace curtains – practically a gingerbread house – the other a grey, weathered shack that looked like the kind of place chickens would meet their end. Yet it’s the gingerbread house that has the witch, in the form of widow Berg, whose goal in life seems to be to make sure her daughter Juliane is married well. Meanwhile she barely tolerates the continued presence of her stepdaughter Anne and Anne’s grandfather (who lives in the scary hut). Anne and her grandfather are very close, but the “new” family (Mrs. Berg and her two adult children from her previous marriage) see them both as mentally off, dismissable, and generally speedbumps in the road of progress. It seemed to be the “old Norway” and the “new Norway” meeting each other together, the old valuing its folktales and traditions, the new valuing, well, money. Things look to be going well for Juliane as she is about to be engaged to a young man from town, Johannes, an alliance which will result a farm for the young couple … but there seems to be something fishy about Mrs. Berg’s rush to make the marriage, and something not on about the title to the farm. And Juliane, the “modern” young woman, begins to seem less sensible than “crazy” Anne, who shows qualities of loyalty and sensibility (while professing a belief in goblins) especially when contrasted with the freshly arrived poet, Birk. It’s clear that the two male/female pairs are mismatched somehow, but a change of alliances seems impossible. That is, of course, until the goblins stick their noses into it, via some spiked punch. This play is a strange and wonderful mess, not as psychologically advanced as Ibsen’s last works, but wonderfully contrasting the banal (Mrs. Berg) with the imaginative (Anne and her grandfather). Ibsen then adds to the mix a character who professes to support “the national traditions,” but only as a method of self-aggrandizement. In fact, this character, Poulsen, seems to see anything he is interested in as basically another decoration for his own wonderful world of Poulsen-ness. His commitment to art of any sort seems as tenuous as Bunthorne’s in Gilbert and Sullivan’s play Patience – basically he’ll feign an interest in anything that draws more attention to himself. The mannerisms and patterns of speech of this character are so like Bunthorne that I thought perhaps Ibsen had lifted the character and dropped it in his play – but apparently vain poets are a more universal phenomenon than I’d expected, as it’s Ibsen that beat G&S to the punch by at least 30 years! At any rate, Poulsen is a hysterical addition to this play, and wonderfully performed by Danny Lee Wynter in a painfully inappropriate blonde wig. To top it off, his friend Jorgen (David Osmond) is on the same level of over-the-top-ness – and while it could have made the play a camp carnival, instead it made it easier to swallow. Goblins? People hallucinating in the woods? Fairy tales coming to life? WHY NOT? Add a dollop of greed courtesy of Mrs. Birk and wide-eyed first love googliness from Anne (Louise Calf) and Birk (Ed Birch), and you’ve got more than enough plot and characters to make for a full night. I found it charming and enjoyable, a good value for the money and very fine performances to boot. Just be warned to snag those front row seats or you’ll find yourself limping out the door.